"Glorious 'Coffee Table' Release Is A Stand Out!" There are some releases in the Elvis world that stand out from the crowd. 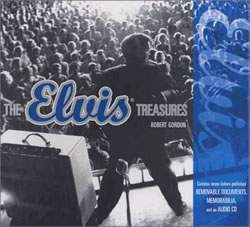 The Elvis Treasures is one of them. Now available, this unusual release is a composite biography, audio CD and amazing set of removable, replica Elvis artifacts from the Graceland archives. It is a great combination, with plenty to offer and intrique any Elvis fan. The removable artifacts are compelling and make fascinating viewing as they bring you much closer to the spirit and life of The King. The Elvis Treasures also includes a one hour CD called 'Elvis Speaks' featuring rare, candid interviews from the 1950s to the 1970s. While there are only 64 pages to The Elvis Treasures, each page is a full colour, high quality inclusion that will delight fans and interest non-fans.